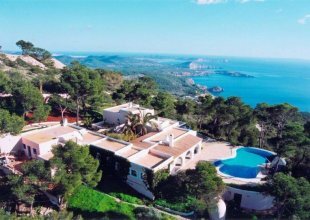 Located on the tip of Cala Vadella, in the exclusive Calo d'en Real complex, Casa del Mar is about 10 minutes drive from San Josep and Cala Jondal and approximately 20 minutes drive to Ibiza Town. This magnificent ocean view villa offers complete serenity and very luxurious accommodation. With 7 spacious bedrooms, 5 marble bathrooms and amazing features throughout, this is a villa that stands out from the crowd. The living area in this villa is spacious, opening up onto the terrace and swimming pool with spectacular sea views. A fully equipped bar and great technical features make this house great for entertaining. The dining area can seat up to 14 people. A fully equipped office with WiFi and a utility room are also located on the ground level of the villa. On the main level of the house are 3 double bedrooms which are all fitted with walk-in wardrobes, outdoor terraces as well as a safe to keep your valuables locked up. There are 2 marble bathrooms. On the first floor is the Master Suite with an ensuite bathroom. This amazing suite enjoys panoramic views of the ocean and a lounge area that opens onto two terraces. There are 3 further bedrooms found on the first floor that all have terraces and wonderful sea views. 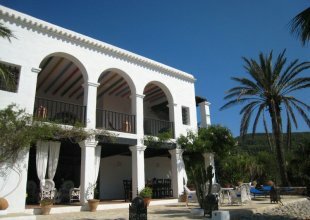 The outside area of this villa offers a feeling of total peace and serenity as well as spectacular sea views. The amazing infinity pool is surrounded by 6-meter long, covered chill out beds facing the spectacular panorama of endless sea views and sunsets. Hammocks, chaise-lounges, sunbeds and parasols are also well disposed throughout the pool area. Some fun features such as illuminated fountains and palm trees also give the establishment a glowing feeling!